2. by Skype or FaceTime, anywhere in the world! and harp teacher for over 30 years. All lessons are with Stephanie personally, not with substitute or assistant teachers. on Lever Harp (aka Celtic Harp), Lap Harp, or Pedal Harp. Finding your own creativity is emphasized. enjoy learning to play harp. Stephanie has taught ages from 4 to 70+. Optional: for students of all ages in California who would like to participate in annual evaluations to recognize their progress, Stephanie is a member of MTAC (Music Teachers' Assoc. 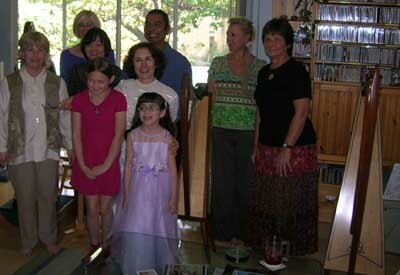 of California) and can enter her interested private students into the highly regarded Certificate of Merit ("CM") program. I enjoy helping students learn the music they want to learn. Of course, no matter what style of music you want to play, it is vital to spend time and effort training in good technique (hand and arm motions, posture, etc.) to be able to play as beautifully and effortlessly as possible. In-person lessons in the Northridge studio may not be ideal for you if you are deathly allergic to CATS. If you study by Skype or FaceTime, though, it won't be an issue! "I've been taking lessons from Stephanie for over 5 years and she is an AMAZING teacher! 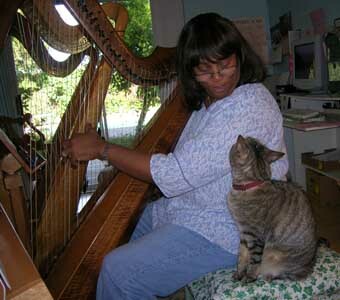 If you have ever wanted to play the harp you can't find a better teacher than Stephanie. She's very patient, encouraging, and inspiring. Every time I leave a lesson I feel like I can play anything! 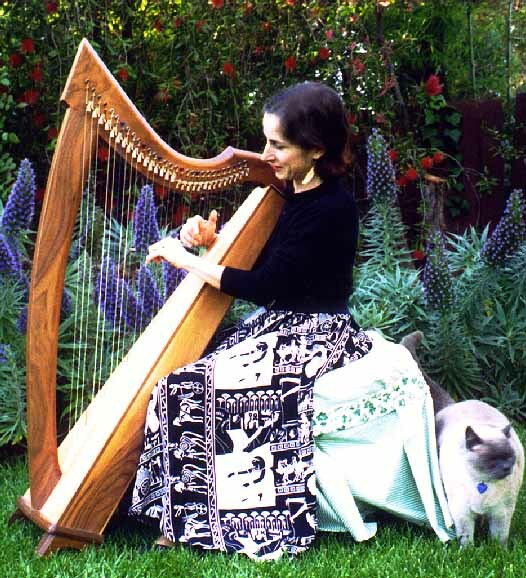 She is extremely knowledgeable and not only does she teach harp technique but music theory as well. and she has great kitty cats!" "Stephanie is an awesome teacher. She is very patient. She has no problem reiterating herself repeatedly when I don't remember what she has taught me. She is creative in her teaching based on the student's needs. She is flexible. She allows me to learn with or without sheet music. She makes herself available to help me whenever I have to learn something for an upcoming performance. I highly recommend her for whoever is interested in learning to play the harp! Contact us to find out what time slots are currently available, and tell us about yourself. 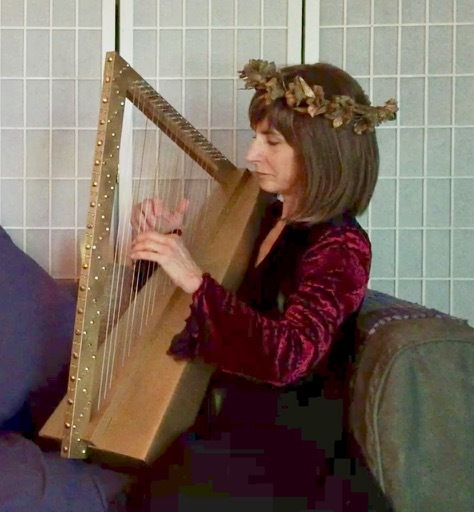 Your harp society can sponsor Stephanie Bennett to give a workshop in your area. 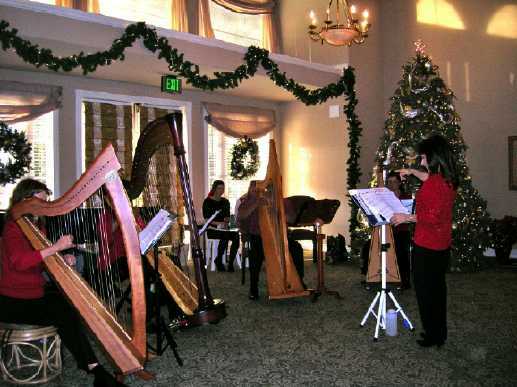 keywords: CM, Certificate of Merit, harp teachers, harp lessons, jazz harp teacher, pop harp teacher, Skype harp lessons, FaceTime harp lessons, music theory lessons.